Goals are unique to each site, and each site will have different metrics that should be measured. Google Analytics goals are a configurable and measurable way to see if visitors to your site are taking these predetermined actions. Here are some common sites, and some common goals for each type of site. 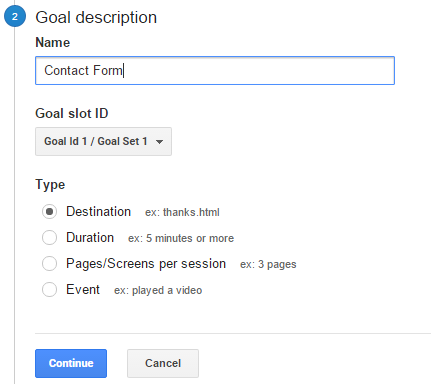 To create your first goal, navigate to the Admin portion of Google Analytics, select your view, and then Goals in the options below. Goals are unique to each view. Select the “New Goal” button to create your first goal. 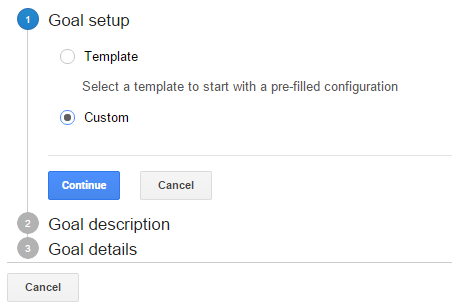 In Step 1, you are presented with the option to use an existing Template, or use a Custom goal. I rarely use templates and always go straight to the “Custom” goal, which is very powerful and allows you greater customization. In Step 2, you will need to enter a Name for your goal. 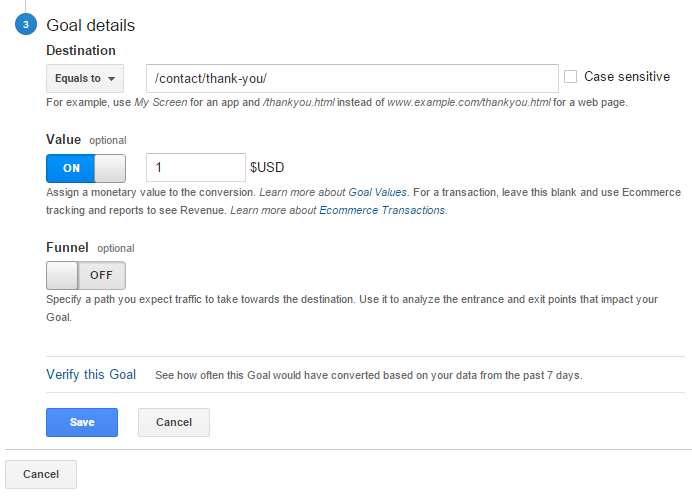 This should be immediately recognizable, as you’ll be using this name across Google Analytics to view your goal. You can always edit goal names after creation as well by editing your goal. In addition to a name, you will also select a Goal Slot ID. It’s ideal to have the most important goal on your site be Goal ID 1 / Goal Set 1. The goal sets allow you to group different types of goals for your site. Destination is a final page that someone will visit, such as a specific thank you page for a contact form or a receipt page for an e-commerce site. Duration is a specific visit length. A good metric is one that is slightly longer than your average visit length. Pages/screens per visit is a quantity of pages that the user visits in a single session. Event is a specific Google Analytic Event that is triggered – many times events are custom programmed, or have to be enabled by your CMS or a plugin. Step 3 will vary depending on which Goal Type you specified – here we are showing a Destination goal. For the destination, you will want to enter the page that the visitor will load to complete the goal. In this example, we have a Contact Form Thank You URL. You can also enter a value for how much the goal is worth. I highly recommend taking the time to figure out your goal value, or at the very least inputting an arbitrary number like $1. This is because having a value will allow Google Analytics to resolve which pages have “value” on your site, so you can quickly see which pages assist more than others. So, let’s say your Average Action Value is $120 (the overall average of this goal), and your Close Ratio (or the % of times you will close each goal) is 15%. This means that your Average Value Of Goal Completion is $18 (120 * .15). So each time this goal is completed, it’s like $18 to your organization. Google Analytics does not have, at current, a way to delete goals. There are a maximum of 20 goals per view. Goals are unique to each view – if you use multiple views, you may need to set up goals across all necessary views. If you have any questions about goals, their setup, or their use, fire a comment below!